I concluded yesterday’s blog with the observation that although its existence has never been proven, the theoretical existence of the “snuff film” was made thinkable because of photographic technology’s automatism, its vulnerability to intrusions of the too real. The intrusion of the too real marks the limit of representation; to go beyond this limit is to be “obscene,” “pornographic,” to be subject to prosecution, and so on. While the proscribed limit is popularly understood as restrictions on the representation of sexual acts, the other side of the same token, of course, is the representation of death. Brakhage’s film thus links the discipline of cinematography with that of coroner: the eye-witnessing of the camera and the “I witness” of the coroner. Brakhage’s film is an act of revelation (Andre Bazin’s privileged mode of mimesis) of the hidden mystery of the body’s dead end, similar to the disassembly of a machine. In a cold, clinical fashion, he showed how faces are peeled off the skull, how the top of the cranium is sawed off in order to allow access to the brain beneath (which is subsequently removed), how the blood is washed out of an eviscerated torso—the truth, as Godard once said, twenty-four frames per second. Jorge Luis Borges, in a short story, once linked death and the compass; Brakhage’s film links death and the camera. The ability to record cold, implacable death is an illustration of the revenge effect of photography’s automatism. Indeed, the clinical recording of death is almost as old as the cinema itself. 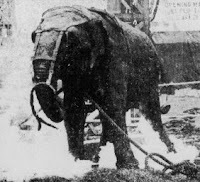 The title of the Thomas Edison short, Electrocuting an Elephant (1903; pictured) blatantly names its diegetic action; although the electrocution of the elephant was staged for the camera to demonstrate to onlookers the dangers of electricity, the film nonetheless recorded an actual event: the electrocution of an elephant named Topsy. Did Thomas Edison make the first snuff film? Of course, “Reality TV” is not premised on the capturing of atrocity, but that is precisely its vulnerability. In order to reveal just how vulnerable the medium is to intrusions of the too real, an example is in order. For my example, I’m going to refer to an event that occurred over thirty years ago, doing so in hope that the event will be largely unknown to a majority of present-day readers. In the years since, similar events have occurred, but my example serves as an illustration of the sort of vulnerabilities of the medium I wish to identify. It was sufficiently sensational to have influenced the medium since, and inspired at least one motion picture. On Monday, 15 July 1974, a 29 year-old anchorwoman for Sarasota, Florida TV station WXLT, named Christine Chubbuck, committed suicide while delivering the station’s morning newscast. (In the years since she seems to have been transformed into a sort of folk hero, as witnessed by the number of websites devoted to her; there's even footage of her on youtube. Whether there's a link to her theatricalized suicide and later events such as Columbine is a subject for further research.) The following account comes from a UPI report filed by Sally Quinn, dated August 4, 1974. Christine Chubbuck flicked her long dark hair back away from her face, swallowed, twitched her lips only slightly and reached with her left hand to turn the next page of her script. Looking down on the anchor desk she began to read: “In keeping with Channel 40’s policy of bringing you the latest in”—she looked up from the script, directly into the camera and smiled a tentative smile. Her voice took on a sarcastic tone as she emphasized “blood and guts…and in living color.” She looked back down at her script, her left hand shook almost unnoticeably. Her right arm stiffened. “We bring you another first.” Her voice was steady. She looked up again into the camera. Her eyes were dark, direct and challenging. “An attempted suicide.” Her right hand came up from under the anchor desk. In it was a .38 caliber revolver. She pointed it at the lower back of her head and pulled the trigger. A loud crack was heard. A puff of smoke blew out from the gun and her hair flew up around her face as though a sudden gust of wind had caught it. Her face took on a fierce, contorted look, her mouth wrenched downward, her head shook. Then her body fell forward with a resounding thud against the anchor desk and slowly slipped out of sight. Christine Chubbuck’s suicide prompted Paddy Chayefsky’s screenplay Network (1976), and is intertextually related to films such as Videodrome (1983). Directed by Sidney Lumet, Network stars Peter Finch (who won an Academy Award for his performance), William Holden, Faye Dunaway, and Robert Duvall. Although her suicide was the inspiration for Chayefsky’s screenplay, the line in which her suicide is alluded to is not actually in included in the released version of the film. However, Sam Hedrin’s novelization (Pocket Books, 1976) of the screenplay contains the allusion: protagonist Howard Beale (the character played by Peter Finch in the film), during a drunken conversation, says, “I’m going to blow my brains out right on the air, right in the middle of the seven o’clock news, like that girl in Florida a couple of months ago” (8). Christine Chubbuck’s suicide is one of many instances of the intrusion of the too real in television, suggesting that if indeed television is a window to the world, that window better be made of bullet-proof glass. Hers was not the only such event. A similar event occurred on 22 January 1987, when, again on live television, R. Budd Dwyer, a Pennsylvania state treasurer then under criminal investigation, during a press conference placed a gun in his mouth and pulled the trigger, committing suicide. In yet another example, during an episode of 60 Minutes that aired on 22 November 1998, footage of Dr. Jack Kevorkian euthanizing Thomas Youk was shown on national television, prompting great outrage: viewers compared the footage of Kevorkian’s assisted suicide to a “snuff film”—the limits of representation had been exceeded, prompting public outcry. Exploiting photography's automatism, Kevorkian videotaped the entire procedure and made the tape available for broadcast on 60 Minutes. Subsequently, he was charged with first-degree murder and convicted of second-degree murder, and was sentenced to 10-25 years in prison—was he actually guilty of murder, or was he punished for violating the limit of the representation of death? I could provide many, many other examples of the too real intruding on the little theater called television—a device the function of which obviously is not to show us the world, but rather to shield us from it. You mention Eddie Adams' 1968 photograph of the shooting of the Viet Cong prisoner. Actual newsreel footage of this murder exists (even more repugnant) and was actually edited TWICE into the montage surrounding a live performance of the song "Circle Sky" by The Monkees in the 1969 movie HEAD. Therefore, it can be said that a snuff movie was included in a picture that was released theatrically by Columbia and rated G ("All Ages Admitted") by the Motion Picture Association of America.